The publisher says… The facts and fun of life as a fox. With their catlike faces, big ears and fluffy tails, foxes appeal to youngsters, but children may not know that a fox can smell prey deep in the snow and that some can climb trees. 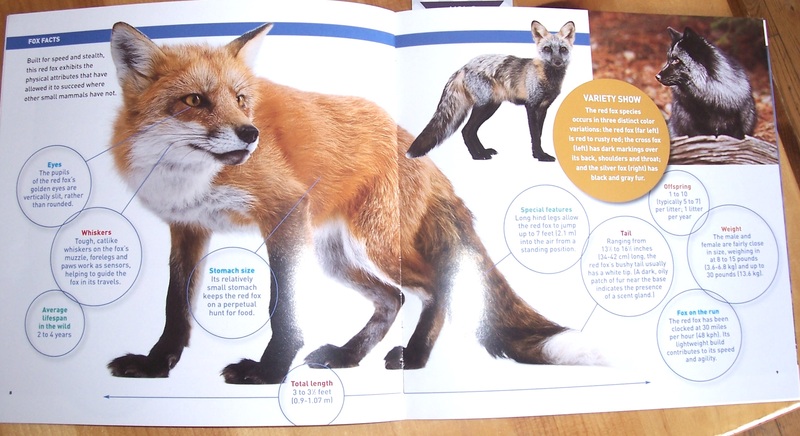 Young readers will learn about the various fox species, such as red foxes, arctic foxes, gray foxes and swift foxes, and they will read about what it would be like to be a fox pup. Photographs of adult and young foxes in their natural habitats and sidebars with storylike content round out this rich portrayal of foxes in the wild. Eva says… Now I know a LOT about foxes but this book has things even I didn’t know. Like they eat more than just chickens and mice and eggs. And they can jump seven feet in the air. And they have really great hearing and smell and eyesight. I just don’t get why more people don’t really LOVE these guys. Because they do a LOT of things better than other animals, and PLUS they’re floofy and cute. But people still hunt them and that really bugs me. But there’s not anything about fox hunting in this book, so if that bugs you, you’re safe. Anyway, MIMI and Maggie sent me this book, so THANKS, Mimi and Maggie!! This is a GREAT one!